Rachel was born in northern California and moved to Arizona with her parents in 2001. Rachel began soccer at the age of 6 in California and played competitively when she moved to Tucson for Tucson Soccer Academy and Rush Soccer Academy until she graduated high school from Catalina Foothills. In her last years of competitive soccer, Rachel had to get shoulder surgery twice causing her to have to take time away from the sport she loved. After starting her undergraduate schooling at the University of Arizona, as a proud Wildcat, she soon found herself bored and extremely out of shape and none of the intramural activities on campus caught her eye. Then one of her friends brought her to 646 to try out a class. 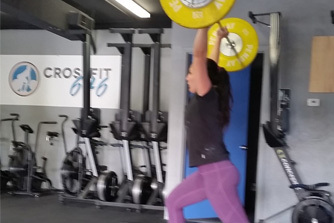 She fell in love with the friendly competitiveness that CrossFit entailed and jumped right into it. In the midst of her start at 646, Rachel realized it was time to focus on her health and nutrition and lost over 25 pounds in just a few months. She saw how CrossFit had changed her life physically as well as mentally and loved everything about it. Rachel began interning and coaching at CrossFit 646 because she wanted to help give others the opportunity to learn to love CrossFit and believe in the methods of community based functional fitness as well. Rachel is currently finishing up her last credits at the University of Arizona to receive a Bachelor’s of Science in Physiology.